Christmas 2001. Hannah was 2. Benjamin was 18 months. I decided against taking them to a studio. I’m not sure why. I was very pregnant with Noah at the time, maybe that had something to do with it. I invited my SIL, who is talented with a real camera, to come over to our house to take some pictures. This was more fun for everyone and we came out with some really cute pictures. We even managed a wardrobe change! They really wanted their bears in the pictures. Awww, these brought a smile to my face, how cute….love the idea with the stockings. 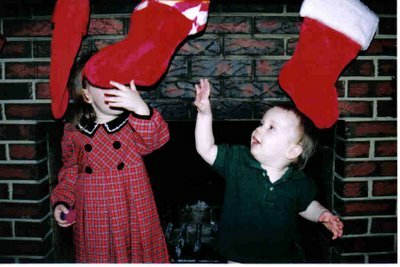 We tried to get a picture of them on the hearth, but they wouldn’t leave the stockings alone. Love these pictures,too! Your children are such cutie pies! I’m so very impressed with having 4 so close in age…You must be a wonder woman or a woman totally trusting the Lord to give you what you need to make it through….I vote on the latter! Thanks for sharing! Giggle, giggle. Your little ones are so sweet! Makes me want to give those chubby little cheeks a (gentle) pinch.Two years ago on Christmas Eve my parents tried to take a family photo of us on their hearth. The kids were tired from the festivities and church service. After a few pics they all started crying in unison and my family were all crying from laughing so hard at the rumpus! I love them! Especially the next to last one. I guess we are going to have try one soon. Last year was kind of funny – Calvin doesn’t like to sit still. Thanks for sharing. Wait until you see the ones with all four! !